The Oak Ridge National Lab’s (ORNL) Summit supercomputer, nearing completion, will be the most powerful supercomputer in the U.S. and maybe the world. 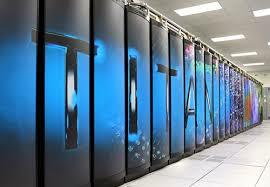 Summit will be 5-10X more powerful than its predecessor, ORNL’s Titan, which will continue running for about a year after Summit goes online. Poor, sad, geriatric Titan is 5 years old and circling the drain. Summit is being built in the traditional HPC cluster style. While each of Titan’s 18,688 nodes consists of one CPU and one GPU; each of Summit’s 4,600 nodes will be stepping out with two CPUs and six GPUs. Each Summit node can manage 40 teraflops. So at peak performance, Summit will hit 200 petaflops (one million billion operations per second). Summit will run on 15 megawatts, but its cooling system (water) will run on 20 megawatts—enough to provide air-conditioning to 12,000 homes. The cooling system runs on water that is 70 degrees F. Anything cooler will drop the temperature too much and form dew—not good for an iPad or a supercomputer. Summit’s cabinets should all be installed by late October, after which it will undergo a year of testing and tweaking, finally taking its place among the most spectacular supercomputers in the world. The full 9/11/17 Wired article by Matt Simon, The astonishing engineering behind America’s latest, greatest supercomputer, is available here.